In San Francisco, December is more or less consumed with preparations for Christmas and celebrating the new year. A pre-holiday visit is an excellent way to get your holiday shopping done, and you could probably do it all in the stores around Union Square. You won't have a white Christmas while visiting San Francisco unless you head out of town to Lake Tahoe, but December is in the rainy season and prone to winter storms. It's also one of the coldest months with the least sunshine. If the weather tries to rain on your vacation, try these things to do on a rainy day in San Francisco. In December, you can expect about 9.5 hours of daylight for exploring the city. If you want to compare December weather to other months, check the Guide to San Francisco Weather and Climate. Use the weather averages to get an idea of what things may be like, but it might be different when you visit, so check the forecast. A winter day could even be so warm you'll wish you packed your shorts. Your best bet is to check the short-range forecast before you go, but it's a hard thing to get the San Francisco weather forecast right, and things could change even after your bags are packed. Be prepared for moderate temperatures, and bring some rain gear just in case. For that, a hooded jacket is a better idea than an umbrella. Layers are also a strategy, and bring a lot of them so you can adjust to match the weather. With two big holidays to celebrate, December is jam-packed with things to do. Celebrate Christmas in San Francisco. View the lights that outline the Embarcadero Center every holiday season. They're prettiest when viewed from Treasure Island (halfway across the Bay Bridge) at twilight. Celebrate New Year's Eve in San Francisco. Indoors and out, there will be parties and public celebrations. 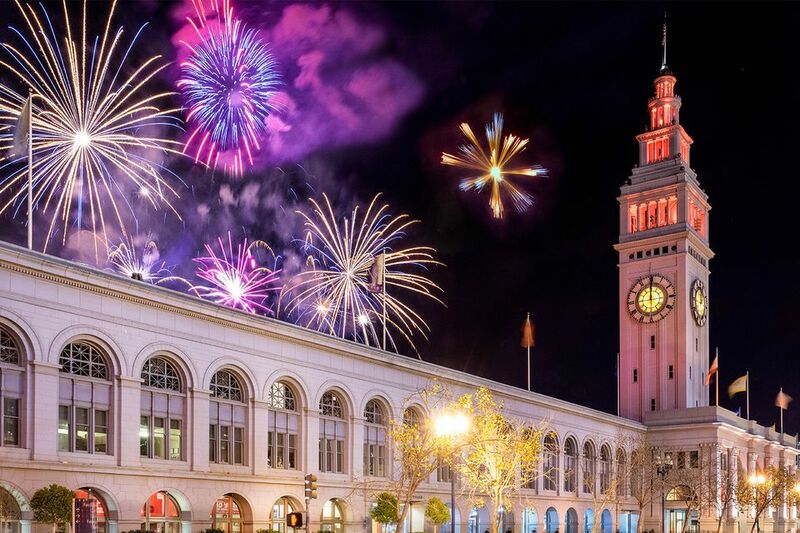 In San Francisco, that usually includes fireworks at midnight on December 31, which happen behind the Ferry Building at the end of Market Street. December is also gray whale season around San Francisco. Find out how, when and where in the San Francisco whale watching guide. Most of San Francisco's December events are holiday-themed and included in the guides linked above, but you can find a few other things to do. Dickens Fair: In December, you can attend a Dickens of a celebration at the Cow Palace. You might be excused for thinking you stepped into a time warp when you walk in the door of this fun celebration of Christmas past. Run Wild: You'll see lots of Santa hats among the people who run this 5K race, but the costumes they wear in this race are fun to see, too. Santa's Skivvies Run, San Francisco: If you always wondered what Santa wears under that big red suit, here's where you can find out. Runners strip down to their Santa themed skivvies and run for a good cause. All you have to do is sign up for a free account with Goldstar to get access to discounted tickets for performances and save on some San Francisco attractions. Even better, it's just as useful when you're at home as it is when you're visiting San Francisco. The San Francisco 49ers might be playing at home while you're there, but Levi Stadium is miles south in Santa Clara. Check the schedule on their website. The Golden State Warriors basketball team plays in Oakland. December is a great time to get the best prices on hotels in San Francisco. With demand for hotels low this time of year, the prices become low as well. Making it an even better reason to visit. December is also in the middle of Dungeness crab season when you can get them fresh. Stop by Fisherman's Wharf (but be sure to ask for a fresh, not frozen crab) or look for them on local restaurant menus. A cold December day is an excellent excuse to try one of the real San Francisco treats—Irish coffee (a mixture of coffee, cream, and Irish whiskey) first landed on U.S. shores in San Francisco, and the bar that introduced it is still going strong.